This Fresh Tomato Basil Red Lentil Penne is a new family favorite recipe. The tomato sauce is completely homemade using fresh, flavorful ingredients. 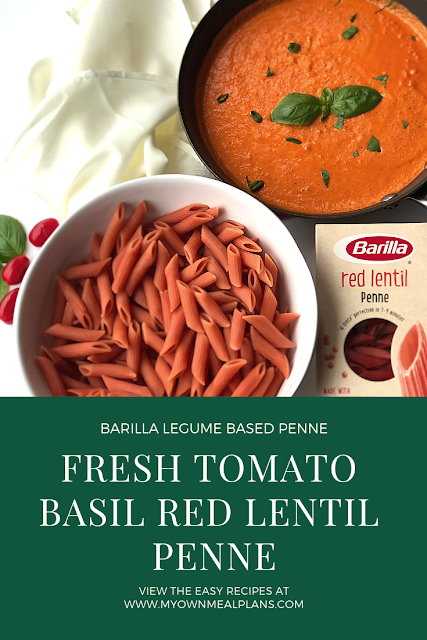 It is served over the top of Barilla's new legume based pasta, Red Lentil Penne. This dish is both healthy and delicious! Make it with me! Start by preheating the oven to 400 degrees. Wrap the garlic cloves in tin foil and roast in the oven for twenty minutes, until soft. Next, boil the Barilla Red Lentil Penne in salted water on the stovetop for 9 minutes. In a blender, add the cherry tomatoes, olive oil, sauteed onion, roasted garlic cloves, italian seasoning, fresh basil, and a dash of salt and pepper. Blend until smooth. Taste and add more salt & pepper if needed. Place the homemade tomato sauce in a saucepan over medium heat. Mix in the penne and cook until heated through. Serve hot.